From the introduction of the first microwave in 1947 through the popularity surge in the 1970s and even into the present day the microwave remains a staple in most homes. Although the microwave has secured itself a spot in most kitchens having the space available for a countertop kitchen appliance of this size often becomes troublesome. For being one of the most used rooms in a house, kitchens are often one of the smallest rooms and lack adequate counter space. One answer to this kitchen/ microwave woe may lie in the Over the Range Microwave. This style of microwave allows for the usage of the vacant area above the kitchen stove and requires no counter space. Now like any kitchen appliance you invest in you want to get your money’s worth, so we have compiled a helpful buyers guide with our Top 8 selections. Why did these models make our shortlist? Let’s get into some details of these units and hopefully help you find a unit that fits your needs and wants. This model is a 950 watt 1.6 cu. ft. capacity microwave. With an easy to use and understand control keypad. This unit offers 6 pre-programmed cooking features to make for one-touch control in microwaving some of your favorites. Auto Defrost feature and reheat functions reduce power output so that you don’t overcook food that you want to warm up but don’t want actually to cook. You can use manual power settings if you don’t like the one-touch controls, and you can also turn off the turntable operation if you choose. This model of GE microwave is available in black, silver and white making this a versatile model for matching any kitchen decor. This model also features a two-speed vent system that helps to eliminate smoke and steam that could arise from stovetop cooking, and a touch control light to provide over the stove lighting. The sleek look to the exterior of this microwave will blend well with other appliances in the kitchen, and the color choices help ensure that this unit can accommodate any kitchen color combination. Recommended for: Those who are looking for the one with an easy to use and understand control keypad. It comes in three color choices. The installation requires only basic skills, and you may be able to install on your own. You can’t bake with this unit. This unit is 950 watts and maybe a bit underpowered for larger cooking jobs. 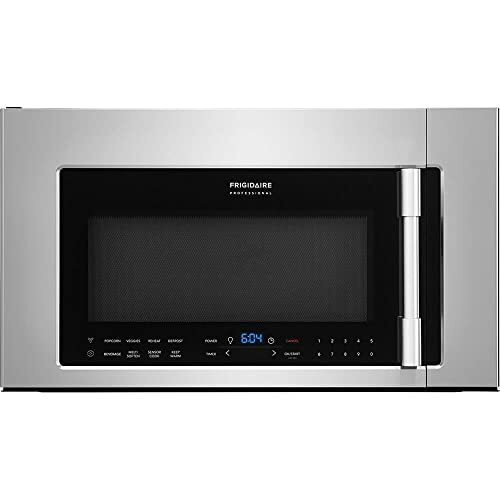 Frigidaire offers this above range microwave model in its smudge-proof stainless steel kitchen appliance line. The FPBM307RF model is 1.8cu. ft. capacity and offers convection oven features as well as microwave ability. 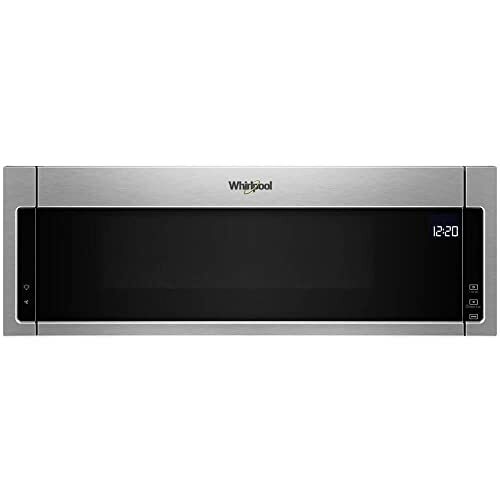 This unit has plenty of power offering a microwave watt rating of 1050, and the addition of convection features allow you to use this microwave for baking. A four-speed fan ventilation system including a turbo setting will make short work of clearing unwanted smoke or steam from the kitchen. The use of LED lighting for both the inside light and the cooktop light provide exceptional illumination in both areas. Offering a hidden vent system with a removable and dishwasher safe grease trap and a charcoal filter this unit has a sleek outer appearance sure to add style to any kitchen. Recommended for: Those who are looking for the one offers convection oven features as well as microwave ability. Larger inside capacity than some. Better lighting and vent fan features than other models. This unit has a sleek in the door control panel. This unit is more expensive than a standard microwave only model of similar wattage. You will most likely need a professional installer to mount this unit. 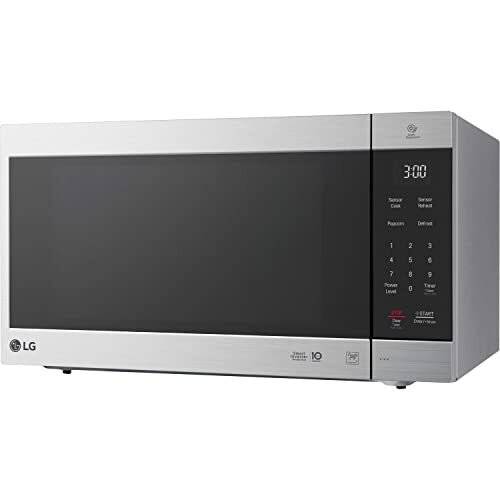 The LG201 ST model features a 2.0 cu. ft. capacity and 1000 watts of power. This is a standard microwave and doesn’t offer any convection oven abilities. If you want a microwave that you can also use for baking, you would want one with convection ability. Model 201 ST has plenty of features to offer the consumer. The unit is available in three color choices, black, white, and stainless steel so you can choose the color that fits your style. This unit offers Ten power settings and the ease of one-touch controls for many of your favorite microwave friendly choices. Also offering reheat and defrost features with custom controls like sensor reheat for perfect reheated foods, and auto and rapid defrost options. You can also take advantage of the bi-level cooking rack features and the ability to stop the turntable action. The LG 201 ST offers a three-speed ventilation fan with charcoal filter and an easy clean interior. Recommended for: Those who are looking for a microwave that you can also use for baking. The control panel display has a green LED illumination. This unit offers plenty of one-touch features and power levels for cooking options. It has a built-in kitchen timer. This unit doesn’t offer the ability to convection bake. Only available in the stainless steel. The WML75011HZ is a low-profile 1000 watt 1.1cu.ft. capacity microwave. This unit is quite small in comparison to some of the other units we reviewed. The low-profile design does allow this unit to be mounted in spaces that other units just won’t fit in and this makes them both special and unique. Now let’s talk about features. Just because you can’t put a large item in this microwave doesn’t mean it’s not powerful. This unit offers a 1000 watt power plant that can make short work of heating anything you can fit inside. It offers six convenience cooking controls and the ability to stop the turntable should you feel the need to do so. You will also find this unit has Ten power levels available and a tap to open door that can be opened with an elbow if you have your hands full. This unit also offers a kitchen timer, cooktop light, and a Four-speed ventilation fan. Recommended for: Those who are looking for a quite small microwaves. This unit occupies very little space. It has plenty of power. It’s available in Four colors including Bronze. It is expensive in comparison to some other comparable models. 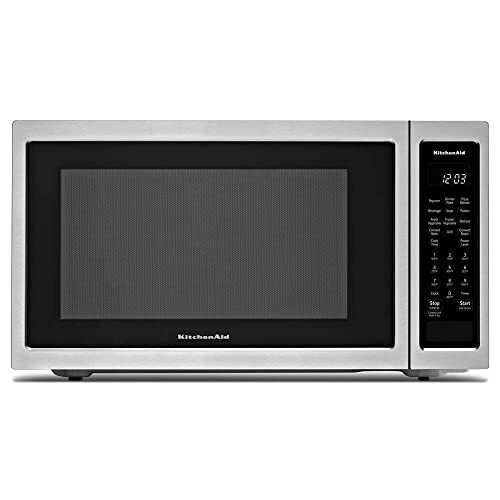 The KitchenAid KLMS311HSS model is also a compact low-profile microwave. This unit also features a powerful 1000 watt capacity. The purposeful interior design of this low-profile microwave is large enough to handle a 9×13 casserole dish. This unit also provides stovetop illumination with a dual setting LED light system, and has a whisper quite Four-speed dual ventilation fan system. KitchenAid has also placed the control pad inside the door to provide a sleek exterior finish that is sure to compliment any modern kitchen. The touch to open feature allows you to access the door still even if your hands are full and for convenience, the cancel, ventilation, and light features can be accessed from the outside. 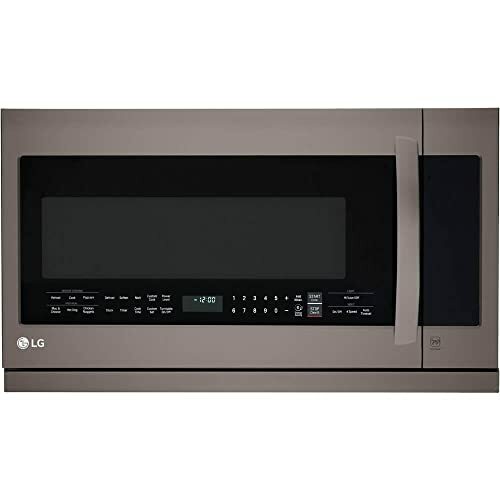 Recommended for: Those who are looking for a compact low-profile microwave. This unit is available in Three Colors. It can accommodate a 9×13 in pan. It has a very sleek outer appearance. It’s expensive when compared to other microwaves. It is limiting on what you can place inside the unit. The Samsung ME16H702SES model offers a 1.6cu. ft. Inside capacity and 1000 watts of power. This is a standard sized microwave not overly large but also not a low-profile model. Samsung has made this unit available in three colors, Black, white and grey with a digital display. This model also comes with an ECO setting that allows you to turn the display off to save electricity, and you won’t need to unplug the unit. All of the colors available have fingerprint-resistant finishes and have Ten power settings. This unit offers standard one-touch controls like potato, and popcorn but also has a +30 button to add 30 seconds of cook time quickly. The unit also has an on/off ventilation fan and incandescent cooktop lighting. 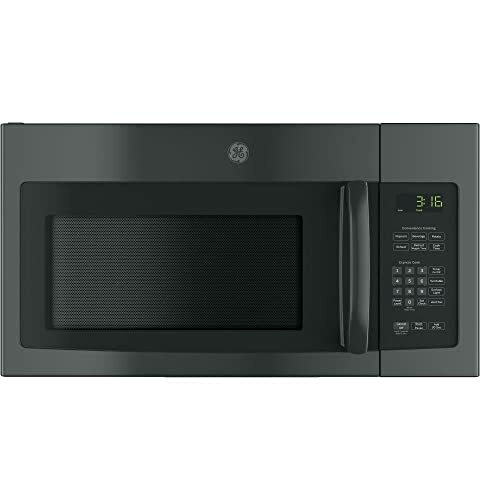 Recommended for: Those who are looking for a standard sized microwave not overly large but also not a low-profile model. Available in three smudge resistant colors. Samsung offers a 10yr warranty on the Magnatron unit. Only has an on/off type of fan ventilation. This unit uses incandescent lighting not LED for the cooktop light. 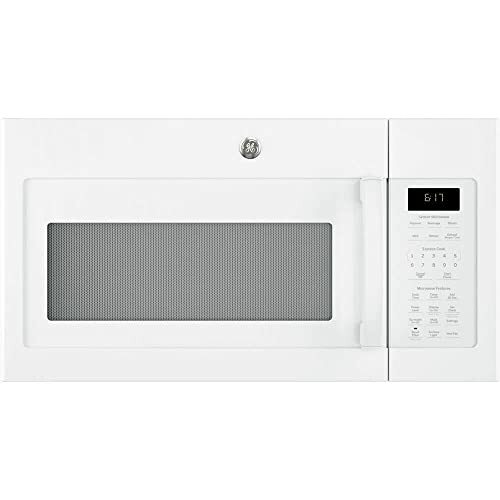 This is larger above the range microwave featuring 2.2cu. ft. of capacity and also has 1000 watts of power. LG LMHM2237BD offers a sleek look and is available in stainless steel with a smooth touch glass display. The ventilation system has what they call an Extendavent to better control smoke and odors from the range top. This is their quiet power ventilation system that helps reduce the noise some other ventilation systems create. This unit provides Eight sensor cook levels and Ten power control levels and has an energy saving mode as well. It offers an easy clean interior and energy saving mode as well. On the inside, there is a bi-level cooking rack and turntable, and you can shut off the turntable if you don’t want to use it. The ventilation system has Four power levels and the range top lighting is LED. Recommended for: Those who are looking for one with quiet power ventilation system that helps reduce the noise some other ventilation systems create. This is a large capacity microwave. It offers plenty of features to assist you. The Extendavent on this unit helps quickly clear ant smoke or smells. It is only available in stainless steel. It is heavier than some other units, and for this reason, may not work in certain kitchen situations. This unit is 1.7cu. ft capacity and 1000 watts. Available in Five different colors to choose from makes this unit a little more versatile and allows for a little more individual style in your kitchen. GE packed a lot of features into this one unit and put it all together on an electronic touch control pad with a digital one line display. You can one touch features like potato, and beverage or one touch an additional 30 seconds of time. Yes, you can turn off the turntable if you want, or you can turn on a kitchen timer all from the same control pad. Many other features are also provided in this unit and include an audible tone that alerts you to change the charcoal ventilation filter. It has a Two-speed ventilation fan and has a Two bulb halogen lighting system that has two brightness levels for the stovetop. Recommended for: Those who are looking for microwaves with a little more individual style in your kitchen. You can easily find a color to match your interior. It has plenty of cooking features. Also has Easy Mount, so you may be able to install yourself. This unit probably wouldn’t do well for baking. You may find that you could benefit from an Over the Range Microwave. If you are limited on counter space or limited on kitchen space and can’t use a microwave cart, you would probably be best served with an over the range model. Some people just don’t like any type of small appliance on the countertop when it’s not in use. Many prefer that spotless empty counter look for their kitchen. Another possible use would be in a camper or travel trailer. In a vehicle like this, you will need a mounted microwave to prevent it from sliding around and falling or having to find a place to store the countertop unit while you drive. 1. First figure out the budget you want to spend. Microwaves can vary in price so you will need to have a good idea of the amount of money you intend to spend on a unit, and don’t forget this may be something you need to have installed, so make sure you budget that in too. 2. Measure the space you want to put the unit in. You will need to be precise in your measurements, and measure it at least twice. Don’t forget to measure the depth too. 3. Understand the features you want in the unit. Knowing what features you want and what you can live without may help keep costs down. If you don’t need the ability to bake you can eliminate any that have convection features. 4. Choose the wattage you need. Knowing what you intend to use the unit for will allow you to eliminate some units. If you intend to use your microwave for cooking meals, you will need a higher watt unit than someone who uses their microwave to rewarm foods. Choosing the color you want or need to complete the style of your kitchen may eliminate some units Some Over the Range Microwaves only come in one color and this might not be what you need. 1. How Much Do Over the Range Microwaves Cost? Prices for units can range from $150.00 to into the thousands. 2. Where Can I Purchase An Over the Range Microwave? 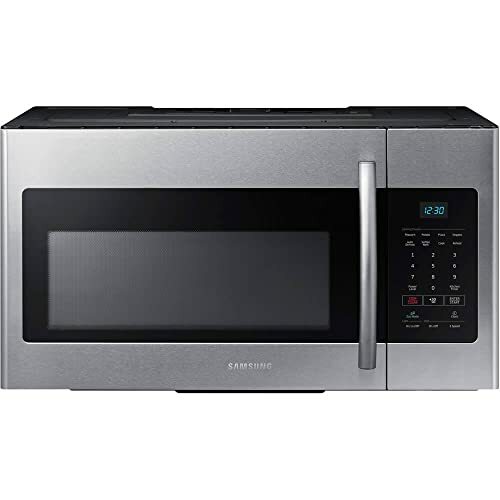 You can find a large selection of Over the Range Microwaves ant many big box stores, and you can order them from multiple online sites as well. 3. Do All Over the Counter Microwaves offer the same features? NO, depending on the model and brand you can find many different feature3 combinations. 4. Can I Install An Over the Range Microwave Myself? Yes, some units can be installed by the consumer with minimal mechanical experience, but others require that you get a professional to install them. There are many Over the Range Microwaves available on the market today, and choosing the right one for your needs may seem like a daunting task, but you can find the perfect unit with a little research. The eight units we have reviewed above have consistent above average customer reviews and are available both online and in big box home improvement stores. I would recommend that you have the unit professionally installed unless you are comfortable with installing an electrical appliance. Any of the microwaves we reviewed would be money well invested, but you would need to decide for yourself what your top pick would be based upon what your needs are for the microwave. Take the time to choose your new microwave after you have considered all of the important details like color, size, wattage, and price so you get a microwave that will keep you happy for years to come. Best Toaster Oven Reviews 2019 – Convection Ovens are Better?